In January we asked you all to help us look after two kittens, Jasper and Beanie with an extremely rare oesophageal condition that meant they would have special needs for life. For anyone new to this story you can read about the 2 special kittens here. Your donations made a huge difference and covered the cost of all their medical needs to date, which is incredible for both the kittens and us as a charity! 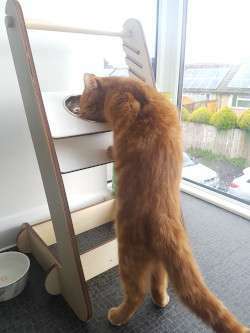 Around a month ago, Joe Perry Gupp contacted us and said he wanted to make each of them a special feeding station with a raised bowl, so when they ate food it would pass naturally down their oesophagus, making their lives as normal as possible. This felt like a dream come true – we had been trying to figure out how to raise the funds for feeding stations for them. Joe works for an innovative design agency and has designed these amazing feeders so as the kittens grow the bowl can be elevated again and again. 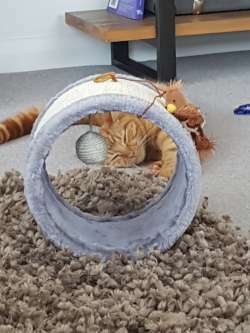 We are delighted to share pictures of Jasper using his feeding station, and we are told he loves using it! 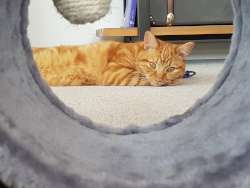 And yes, in more fantastic news; those pictures are taken of him in his new home where he settled in within the space of an hour and is the picture of content! Gloucestershire Cricket Club muck in!